Saturday night, my family cooked a lowcountry crab boil (aka Frogmore Stew, although sometimes that one doesn’t have crab). It was the best meal ever. Serve it with some drinks and crusty bread; it’s always a party. Simple, yet tasty. 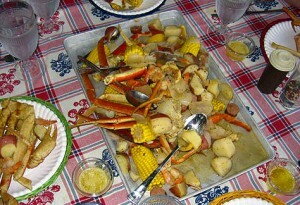 Also known as frogmore stew, this dish is very easy to cook & turns any regular meal into a party. Perfect for the summer…or winter. That looks SO YUMMY!! My Lean Cuisine Panini is just SUB-PAR upon seeing that feast!